The other day I was talking with a Sales friend of mine and I asked him what do you feel is the most important thing that anyone should know about Sales? 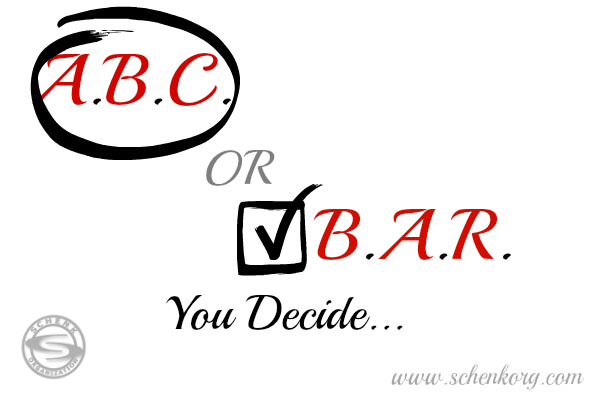 Seeing as how Sales wasn't my first career choice or the initial path I went down in life I asked him what does A.B.C. stand for, and what does it mean to you? He told me boldly that A.B.C. stands for (A)lways, (B)e, (C)losing. I gave him a funny look and said what are you trying to close? He smiled back and me and said I am always trying to close on the deal at hand. I am always trying to get to the money. I said huh... and tell me what that means to you. He smiled and said take a look around, anything you want in life you can have if you know how to sell. So I repeated to him, so it's all about getting the money, it's all about closing the deal? He shook his head "Yes" and said to me I don't know how you don't already know this or understand this concept. So I asked him a question (or actually two)... What if you didn't know anyone that you could sell to? What if no one wanted to buy anything from you because they didn't know you? He got a weird look on his face and said why should I worry about that people are always wanting to buy things that's just human nature. People are just looking to give their money away, why shouldn't they give it to me? I told him I'm not sure if I agree with that mindset. I asked him to consider a thought for a minute, and then ponder it, and when he was ready we would discuss it. What if instead of (A)lways (B)e (C)losing we tried to B.A.R.? He looked at me funny and said what does going to a BAR have to do with selling? Then he stopped and thought for a split second and he said yeah I guess if you go for drinks with a client that would loosen them up a little bit and make it easier for them to part with their money. I just smiled back at him and said that isn't what I meant by B.A.R. what I meant was (B)uild (A) (R)elationship. He looked at me funny again and said huh, I don't want to hang out with these people I just want to sell them something. I just smiled back at him and said think about it and when you're ready to talk about it let me know. I think there is a place for both in the world of Sales, but I personally feel you can't have the A.B.C. with the B.A.R. I also wonder how many more Sales you could do if you changed your focus to be on the B.A.R. rather than the A.B.C.? What are your thoughts on the A.B.C. and the B.A.R. ideas? On where your focus in Sales should be? Do you think times are changing in the world of Sales? * Last but not least "Thank You" for taking the time to read this post, and for letting me share some of my thoughts and ideas with you. I would appreciate any comments or thoughts you would like to share.